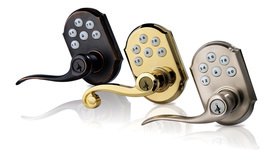 We proudly carry Kwikset's complete line Z-Wave, Zigbee and Bluetooth electric locks. Our Kwikset line of electric Z-Wave locks work great on their own but really shine when they are integrated into your home control system and give you complete control over who has access to your home. They also allow you to be notified and trigger devices in your home when someone enters their code into the lock. You can easily set up different notifications and triggers for different peoples codes. For instance, you can get a push notification on your phone when your kids get home or you can set your favorite music to play when you enter your code. The possibilities are endless. 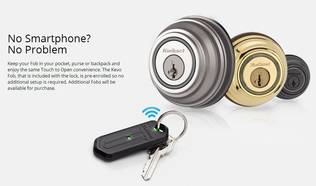 Kwikset's Kevo locks connects directly to your smartphone, giving you access to all of your Kevo locks with only your smart phone. The Kevo does not give you as many features as the Z-Wave option with a Control, Automation and Monitoring System (CAMS) but is easier to unlock as you only need your finger and your phone in your pocket to unlock. Kwikset's SmartCode feature allows you to connect your Kiwkset electric lock to your home control automation and monitoring system (CAMS). This allows you to add and delete pins from any computer with internet access. All Kwikset electric locks included standard metal keys as backups. Kwikset's lineup also has a feature called SmartKey that allows you to re-key your lock in less than 10 seconds saving you over and over the cost of re-keying your lock with a locksmith. This can be a great benefit if you have a rental or you give a lot of keys out to maintenance people or friends and family. If you have current Kwikset locks, you can easily re-key your new Kwikset lock to your old keys so you do not have to keep adding keys to your key ring. The keypad models are great for visually impaired and the screen models are sleek, modern and great looking with any door and exterior trim. Give the ability to lock the door with the touch of one button. Kwikset's SmartKey re-key technology provides you the flexibility to re-key your locks quickly and easily without removing them from your door. If you are a Landlord or someone who needs to re-key your locks frequently, Kwikset is for you. With your own personal code, you can enter your home with just a few simple pushes of a button and lock it with just one. You also get more control over who has access to your home. Just assign a temporary code to who ever needs one and delete it when you see fit. Now you can totally eliminate the need for keys. SmartCode allows you to connect your Kwikset Electric Door Lock to your home control system giving you unlimited control and automation options you do not get with a regular door lock. Kwikset's Z-Wave Electric Deadbolt Touchscreen Deadbolt Door Locks. The touchscreen models have a sleek touchscreen for the keypad and have all of the features of the other electric Z-Wave door locks. Kwikset's Z-Wave 5 Button Keypad Electric Deadbolt Door Locks. The only difference is the keypad. The 5 button has 2 numbers on each button. The 10 Button has 1 number on each button. This line has SmartCode and SmartKey technology and can work as a stand alone unit or connect to a home controller. 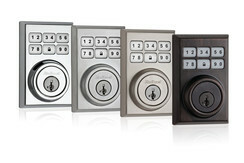 Kwikset's Contemporary Z-Wave 5 Button Keypad Electric Deadbolt Door Locks. This line is the exact same as the 5 button deadbolt keypad, but the Contemporary line has a Contemporary look to it to fit in with today's modern homes. Kwikset's Z-Wave No Keypad Electric Deadbolt Door Locks. The only difference is, there is no keypad. Kwikset's Z-Wave 5 Button Keypad Electric Lever Deadbolt Door Locks. Kwikset's line of Z-Wave electric lever door locks are great if you are securing a interior door or do not have a deadbolt hole on the exterior door. This line is the same as the 5 button keypad but are not deadbolt locks. They have a lever to open the door and are meant to replace your door handle. Kevo is a wireless (bluetooth) deadbolt lock that communicates with your smart phone or a key fob and your Kevo account to grant you access to unlock your door when you physically touch your Kevo deadbolt lock. You can send virtual keys and control when they will work, to people with a smartphone and the Kevo app installed on it. This line has SmartKey technology.